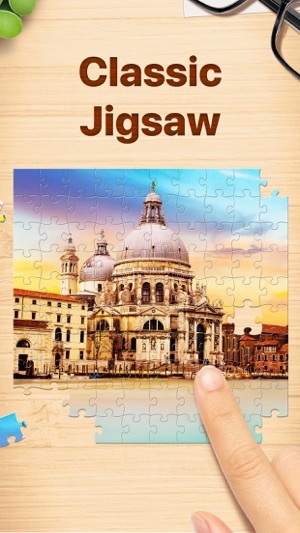 Welcome to the colorful world of jigsaw puzzles! Tons of FREE HD pictures, hours of fun and no lost pieces. Relax your mind putting puzzles together! · Custom backgrounds. Choose your favorite appearance to play with more pleasure. Make every day relaxing and fun putting puzzle pieces together! 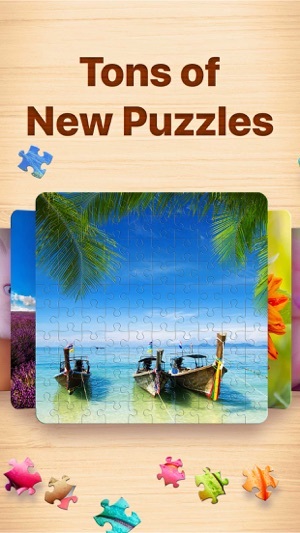 Jigsaw Puzzles Premium Subscription allows you to unlock everything, access daily updates and remove ads. Monthly subscription with a 3-day free trial period is $9.99, and annual subscription is $39.99 or equal to the same price tier as Apple App Store Matrix determines as the equivalent of subscription price in USD. Payment will be charged to iTunes Account at confirmation of purchase. Subscriptions may be managed by you and auto-renewal may be turned off by going to iTunes Account Settings. For more information please visit the link https://support.apple.com/en-us/HT202039. No cancellation of the current subscription is allowed during the active subscription period. Unused portion of a free trial period will be forfeited when a user decides to subscribe. We read all your reviews and always try to make the game better. Please leave us some feedback if you love what we do and feel free to suggest any improvements. Make every day a happy day putting puzzle pieces together! 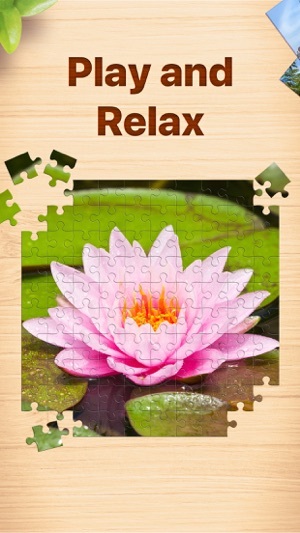 One of my favorite puzzle apps EVER! 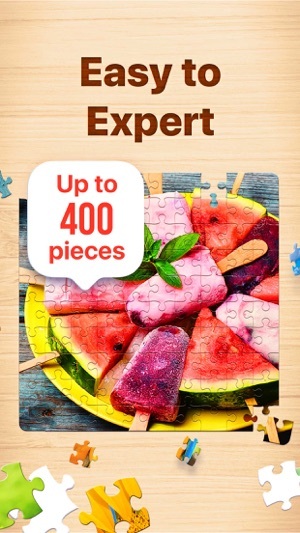 I’m a big puzzle person, and have been looking for a good puzzle app and just haven’t been able to find one until a couple weeks ago when I found this app! There’s so many beautiful puzzles! Not only is the app free, but you have access to ALL of the puzzles, unlike most puzzles apps I’ve seen. 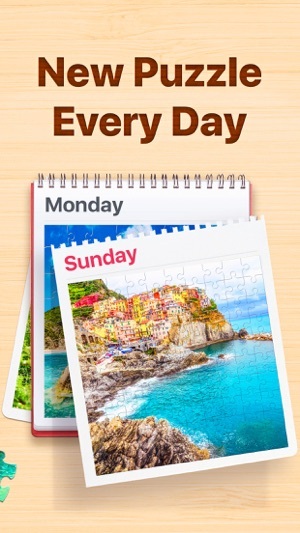 There’s also a daily puzzle, and there’s new puzzles all the time! The only issue that I have is I wish you could make the puzzle have more pieces instead of only going up to 400, while that is a challenge, I would like to see the pieces go above 400. While there is new puzzles all the time, I would like to see more than just a couple new ones come out a time. When the new puzzles come out it’s only like 3 or 4, and I know that’s probably because it’s hard to even release 1 into the app, but if you can, I would like to see more come out at a time. If you read this, thanks, and I hope the developers took this into consideration! Hi! Thanks you so much for your review. We'll consider implementing more than 400 pieces, thanks for your help! The collection of puzzles is updated daily with tons of new pictures are added every Thursday. If you have any questions, let us know and we’ll be happy to help! I looked at pictures (screen shot? ), they show pieces slightly rotated, I used to have a puzzle app that allowed for freely rotating pieces, app pictures are misleading! No way to freely rotate! Former developer response wasn't helpful all they did was give me instructions for rotating 90 degrees by clicking pieces, images on App Store show pieces at 45 degree making me think freely rotating like handling real pieces but this isn't true. Try again and please look at your advertisement images and read my problem Thanks. I will check again another time to see if they update the app. Why is it that tech people read half of a problem then give the wrong solution and think they have fixed anything? I'm ashamed to be a tech guy when this happens! I would remove the only star I gave for this! They have fake screen shots!!!!! That is what I'm judging there app on!!!!! And they seem to have no clue????? Because they try to fix my problem without READING!!!!!!! Hi! Thanks for sharing your feedback. We'll consider your suggestion. And we'll take into account your comments about screenshots. Thanks for your help in this matter! Stay tuned for our upcoming updates! I love doing puzzles but my 4 legged friends offer more help than I need. This app allows me to still keep my mind and hands busy without losing pieces to the cats and dog. It’s also nice when I have bouts of insomnia because I don’t wake my husband while trying to do something that’s relaxing until I can sleep again. I have never made a purchase but there are hundreds of puzzles to purchase if you don’t like the free puzzles but I think the free puzzles are challenging. You can purchase hints if that’s your thing but I don’t think it’s necessary. I use it as a totally free App. You do have to watch a couple of 5-10 second commercials but usually no more than 2 per session.